A Unschool math curriculum is kind of funny term since most unschoolers don’t use any kind of curriculum. Most Unschoolers let their child learn from life or use the world as their classroom. Unschooling is a self-directed learning where the child decides what they want to learn and how they want to learn it and we “as parent” guide them on their educational adventure. I honestly believe that if you want to use curriculum as a teaching tool for your child it is perfectly ok. Always tell people to do what is best for your family. Our family has used Life of Fred and Khan Academy as a tool to help learn math. We have loved both and dislike a certain thing about both of them. You need to be the judge and decide for yourself. I like the idea of using a math curriculum as a tool because I have no idea what my child’s future holds and if they will decide to go to college or Uncollege to find their future jobs. These books start at Kindergarten and go beyond college level math. You basically read a chapter then do some math problems at the end of each chapter. The question and answers are sometimes on the same page but are very good at explaining how Fred got the answers. If your child is having a hard time understanding math concepts you can begin them with apples, Starting in “Intro to Algebra series books“ kids start taking bridges where the child has 3-5 chances to take the exam and see if they understand the concepts. If they don’t, no big deal, just read the chapter over and try again. My youngest and I read the chapters together and then I read the math problems to her and we go over the answers together. Our oldest does her pre-Algebra chapters on her own and then has me check her answers, sometimes. My youngest started with Mineshaft (Intermediate Math) and my oldest started with fractions (Intro to Algebra). Only takes a few minutes a day. Easy to understand and girls like the funny stories. Religious – You could go either way. So far we have not run into a lot. Fred does talk about going to church and every so often (five chapter between) he refers to a bible verse (like John 3:4). So you can choose to ignore it or look up the verse if you like. There is no preaching like you will go to Hell if you don’t do this etc, but Fred does talk about right and wrong, which I really like. Please make your own decision based on your family. The price of books is $12 – $45 the series could get costly if you are on a budget. You can buy the books used. If you are just starting Khan Academy your child can take a test and Khan will tell you where you need to start, or you can just pick a grade (that’s what we did). The child picks what they want to learn and then they must do a series of problems (1-10) to go to the next level. There are usually five levels but you can take a Master challenge to skip all the levels. 24 hours after you learn a new thing there is a Master Challenge, where you have to answer 1-2 questions correct to opt out, but if you get it wrong they will bump you down to lowest level (very upsetting).There are videos to help you or a parent to understand. You can learn math, coding, High school history, art, science, and much more. You can order workbooks and schools can use this as their teaching tools also. An avatar that you can change and evolves as you do. Teachers or Parent can see what their whole class is doing and who needs help. Can use your iPad or iPhone to do problems. FREE – 100% free to use. Need internet to log in. videos sometimes are not helpful. Master Challenge – every so often if the internet had a glitch, the kids would pick the right answer but the computer would record the wrong and get bumped down. We now use Life of Fred books because we had so much problem with the internet. I have read on a few forums. One mom state (I do not know her name) that her child did a college entrance exam and tested so well he was able to skip Calculus, but don’t take my word for it do your own research. 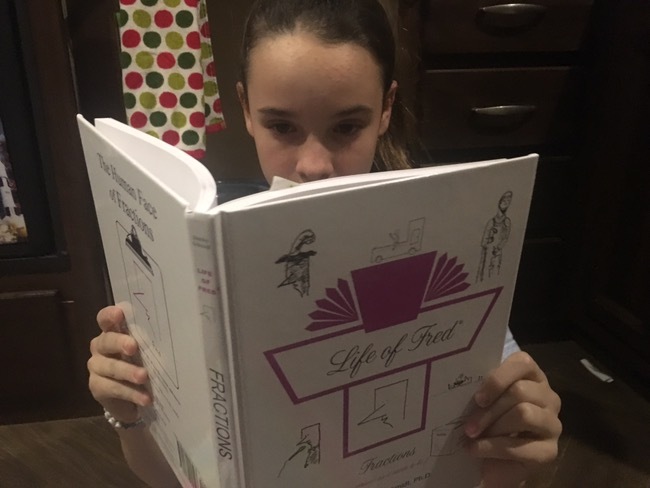 This entry was posted in App Queen, Computer skills/programming, Math, Math Games, Unschooling, Unschooling FAQ and tagged khan academy, Life of Fred, math review, Unschool Math Curriculum by Chrissie. Bookmark the permalink.